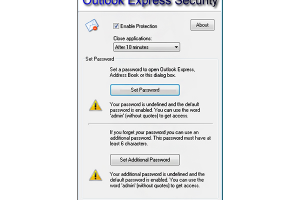 "Password-protect your Outlook Express mail client"
The product presented here is called Outlook Express Security. Outlook Express is a basic yet versatile Microsoft email client with several interesting features we presented on a dedicated page you can reach by clicking on the provided link. This email client also comes standard installed on several Windows operating systems. For more details check out the preview images posted alongside this article and proceed to the download.